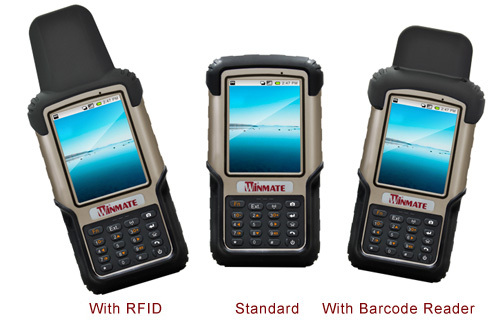 As the growing demands of a robust handheld device in ruggedized market, Winmate launches its new innovative 3.7” rugged handheld device. Its ultra rugged design complying with MIL-STD-810F and IP67 protection is designed for all kinds of harsh environments such as offshore industry, petroleum industry and police application. The 3.7” handheld R03TACH-RTS1 integrates technologies including GPS, RFID, 3G and Barcode reader. These modules are considered as most wanted functions for the end users. Embedded with TI Cortex A8 processor, this 3.7” LED panel supporting 480x640 resolution provides flexibility for users. Firstly, operating system can be selected as Windows CE® 6.0 or Android 2.2. The keyboard design and stylus also facilitate users to navigate the screen. With regard to I/O, featuring with RS232 serial port and USB OTG, R03TACH-RTS1 also has speaker and audio inside. The expansion slot can be inserted into a micro SD that enlarges storage. 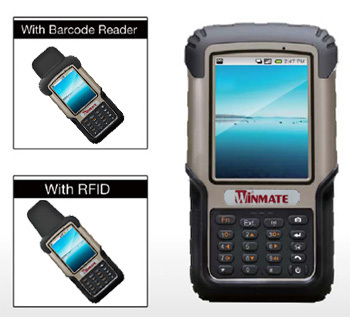 Optional barcode reader and RFID reader further enhance its capability in more kinds of applications. Meanwhile, it not only supports Bluetooth, but also optional GPS and 3G module supply more availability in the communication aspect.